The Paris Agreement on Climate Change (Agreement) is being hailed by its proponents as a huge step forward in reducing global greenhouse gas (GHG) emissions and saving the environment. However, further review of what the Agreement will actually accomplish raises several questions about its effectiveness, true costs and impacts on energy availability, grid reliability and the average citizen’s standard of living. Environmental Protection Agency (EPA) director Gina McCarthy called the Agreement “an incredible achievement” during recent testimony before the Congressional House Committee on Science, Space and Technology. But in response to direct questioning by committee members, she was unable to even estimate its potential cost and repeatedly failed to explain how much its implementation would delay any increase in global temperature. “North America has the capacity, resources and the moral imperative to show strong leadership building on the Paris Agreement and promoting its early entry into force,” they stated. However, their collective statement also failed to address either how effective the Agreement’s implementation would be in reducing global warming, or its potential cost to working people, businesses, industries and families in their three nations. Even if every nation fulfilled every Paris Agreement promise by the year 2030, the total global temperature reduction would be less than one-tenth of one degree Fahrenheit by 2100. 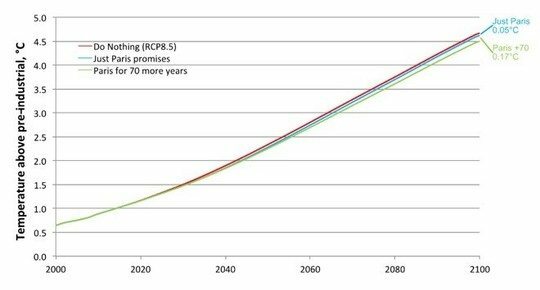 Even if every nation would extend that commitment for another 70 years, the entirety of the Paris promises would reduce temperature rises by only three-tenths of one degree F. by 2100. Even if U.S. climate policies were fully achieved by 2030, and continued until the end of the century, global temperature rise will decrease by less than six one-hundredths (0.06) of one degree F.
Even if China climate policies were fully completed and continued throughout the century, global temperature rise would be decreased by less than five one-hundredth (0.05) of one degree F. by 2100. In short, Lomborg alleges the Agreement will fail because it makes “promises that are individually expensive, will have little impact even in a hundred years and that many governments will try to shirk.” In other words, it will cost a fortune while producing virtually no measurable change in either global climate or temperature. Meanwhile, China has been putting a new coal-fired electricity generating plant on line every seven to ten days and has immediate plans to construct more than 150 new coal-fired plants. Japan also has 47 more coal fired plants in the pipeline. In the U.S., the EPA adopted administrative rules in August of 2015 attempting to enforce its Clean Power Plan by bureaucratic fiat. The agency plans to invoke provisions of the 1970 Clean Air Act that the Agency construes to authorize the forced replacement of coal-fired generation with non-fossil fuel sources such as wind, solar, nuclear, geothermal and other renewables. Its aim appeared to be to virtually eliminate the generation of coal-fired electricity in the U.S. The Plan specifically deters the shift to the use of our abundant and inexpensive supply of natural gas. The purposeful obstruction of the market-driven change to natural gas generating is particularly troubling because it is the increasing use of natural gas that is primarily responsible for the reduction of the U.S. share of global GHG emissions to late 1990s levels. In a stinging rebuke to the Obama administration, the United States Supreme Court placed a hold on the Clean Power Plan earlier this year. It was one of the final official acts of longtime Justice Antonin Scalia, as he passed away days after that decision was issued. The February 7, 2016 stay suggests the Court does not believe the Clean Air Act authorizes the regulatory activities that EPA included in its rulemaking. That stay will remain in place until an Appellate Court rules on its merits. The Supreme Court may subsequently either rehear the case or allow the lower court ruling to stand. The hold is likely to remain in effect for at least 18 months or longer, depending upon how quickly the appellate process proceeds. Unfortunately, the Supreme Court stay does not affect Oregon’s first-in-the-nation Coal to Clean law enacted during the 2016 session. House Bill 4036 virtually doubles the State’s Renewable Portfolio Standard, prohibits coal-fired generation within the State and phases out the Oregon use of electricity generated from out-of-state coal fired plants. The Oregon Public Utility Commission pointed out the law will result in little, if any, overall reduction in GHG emissions. The only coal-fired plant in Oregon, the Boardman facility, is already scheduled to be closed. Coal-fired plants located in other states, currently supplying electricity to Oregon, will continue to operate into the foreseeable future. Those plants will not cease to operate, will not stop using coal and will not reduce their GHG emissions as a result of Oregon’s Coal to Clean law, despite its proponents’ constant claims to the contrary. Although the scheme will serve to help meet Oregon’s GHG reduction goals, neither regional nor global GHG emissions will be measurable reduced. The costs to Oregon households and businesses will be enormous. It is worth noting that Oregon currently produces only about four ten-thousandths of one percent (0.04 percent) of global GHG emissions. That represents an unmeasurable one part in 2,500, and does not count the emissions from catastrophic wildfires that seem to burn every summer in our rural, unmanaged government-owned forests. Most informed proponents of Clean to Coal understand even the complete depopulation of Oregon would not result in a measurable change in global GHG emissions. However, they assert that Oregon’s first-in-the-nation leadership in GHG emissions is worth the certain impending cost and anti-business effects. In his aforementioned article, Lomborg explains that “subsidizing inefficient renewables is expensive and doesn’t work. The International Energy Agency estimates that we get 0.4 percent of our energy from wind and photovoltaic solar right now, and even in optimistic scenarios the fraction will only rise to 2.2 percent by 2040. Over the next 25 years, we’ll spend about $2.5 trillion in subsidies and reduce global warming temperatures by less than 0.02°C.” According to the Oregon Department of Energy, solar renewables currently provide only 0.17 percent of Oregon’s electric generating capacity. This is despite the massive public subsidies given to so-called “green energy” companies by our state government over the last decade. Lomborg further explains how countries are on the wrong track in their efforts to reduce GHG emissions. “Instead of trying to make fossil fuels so expensive that no one wants them – which will never work – we should make green energy so cheap everybody will shift to it,” he wrote. Until those renewable energy sources become economically feasible, the continued shift to natural gas for generation of electricity and transportation fuels is our best bet to reduce GHG emissions. It is both abundant and cheap. Effective technologies for its use are already in place. Most important, little or no government interference or subsidies will be required. The change will be market-driven because, in most situations, the change to natural gas will actually reduce the consumer cost of energy. Our leaders will soon have to decide what kind of energy future they want for this state. Deliberately using the heavy hand of government to create artificial scarcity, where there is currently abundance, will result in further struggle for middle and lower-class Oregonians far into the future. Attempts to “transform the market” through regulation and subsidies have failed by most objective measures and have largely only served to divert limited public funds and resources away from critical areas like law enforcement and education. In contrast, we already have the ability to reduce GHG emissions through voluntary means that will better serve consumers and businesses alike. Hopefully, common sense will prevail over ideology and enable us all to keep the lights on and our homes adequately heated. Because as history shows, having the government pick winners and losers ultimately creates more losers than winners, and will cost all of us dearly.